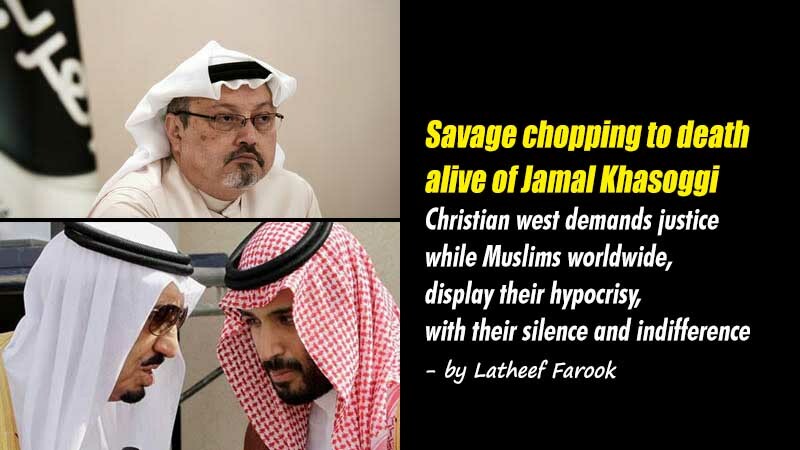 (Lanka e News - 25.Oct.2018, 4.50AM) While the entire Christian West-governments, civil societies and the media-continue to highlight the gruesome chopping to death of highly connected Saudi dissident-in-exile Jamal Khashoggi, Muslims worldwide remain silent and indifferent displaying their hypocrisy. As we know on 2 October 2018 a 15 member killer squad dispatched to kill Khasoggi dragged him from the Saudi Consul General’s office in Istanbul where they threw him onto a desk , cut his fingers and tortured before chopping and dismembering alive during a seven-minute execution in the presence of Saudi Consul Mohammad al-Otaibi. The audio recording this savage killing said to have captured the missing journalist's dying screams, before he was 'injected with an unknown drug' and fell silent. There was no attempt to interrogate, but to kill him. This unprecedented barbarity was committed on the instruction of Saudi Prince of death Mohamed Bin Salman who, has graduated from the family tradition of chopping hands and heads in public plazas to dismembering bodies in overseas consulates. This is sheer barbarity and has nothing to do with the peaceful message of Islam. However the irony is that killer Salman is the de facto Custodian of the Holy Mosques in Makkah and Madina. Yet there was no condemnation in general from Muslims worldwide including Sri Lankan Muslims. On the other hand it is not possible for people in most Muslim countries to speak out, leave alone coming out on street protests to condemn this heinous crime, as they remain brutally oppressed by regimes , installed by Europe and US, who deny even basic freedom to people. However, due to electronic media, , despite suspected US and Turkey moves to cover up the killing, it has become difficult to hide Salman’s barbarity as the unfolding events disclose details of the pre meditated and pre medieval style barbarity which brought unprecedented shame to Islam, Muslims and humanity as a whole. While Muslims remain silent, calls started to emerge in the Christian west to free the holy cities of Makkah and Medina from Saudi tyrants to be administered by a Vatican style administration. In fact this was the call made by Ottoman Governor in Makkah Sheriff Hussein almost a century ago in the aftermath of the defeat of the Ottoman Empire in the World War 1 in the early 1920s. He suggested the establishment of Caliphate in Makkah to manage Makkah and Madina by a council of representatives of Muslims from all over the world including Sri Lanka. Britain and France, busy partitioning the Middle East to suit their evil agenda against slam and Muslims, were alarmed. They were joined by Zionist Jews .They screened and picked up Saudi tribal Bedouins in Riyadh, gave them five million sterling pounds and supplied with weapons to attack Sheriff Hussein and bring Makkah and Madina under Al Saud control to suit European masters’ agenda. Since then Saud family, hand in glove with their European masters, implemented all their evil designs against Islam and Muslims. They spent billions in all US-European wars against Muslims. Genocide in Yemen being the latest. They promoted subversive version of Islam, sect of Wahhabism, which became the founding cult of the Saudi regime. This treachery continued until Salman discreetly supported President Trump’s illegal move to shift US Embassy to Jerusalem to please Trump and his Zionist Jewish son in law Jared Kushner. They gave the country’s highest award to Trump, sworn enemy of Muslims. They signed 315 billion dollar weapons contract to US- perhaps to kill Muslims. Trump who refuse to condemn the Khashoggi killing said Saudis are purchasing 110-billion-dollar worth of weapons providing jobs to 500,000 Americans. As days pass by he is getting exposed of his greedy for money. Over years today Israel and Saudis have become two sides of same US-European coin implementing their agendas against the Muslim Middle East. Salman, as de facto ruler, as unleashed waves of terror against Islamic scholars and started arresting, torturing and killing them in the cruelest manner. Unable to put up with these atrocities and for killing Khasoggi which "goes against Islam, human ethics and standards". a group of Saudi scholars have called for the removal of bin Salman from power. Going a step further Saudi dissident Saad al-Faqih of the Movement for Islamic Reform in Arabia said in an Al Jazeera program that not only Salman but the entire Saudi family should be removed from power and the country need to be freed from US-European backed tyranny. Under such circumstance isn’t it the responsibility of Muslims worldwide, including Sri Lankan Muslims, to condemn this barbarity and call for liberating Makkah and Medina from the shameful grip of this family. What is happening in Makkah and Medina should be the concern of Sri Lankan Muslims too. Muslims in the island do not have an effective media .Under such circumstance isn’t it the responsibility of All Ceylon Jamiathul Ulema, ACJU, Tableeg Movement and others who control mosques to use Friday sermons to speak about what is going on in the land of Islam and educate Muslims .The community’s failure to do so and silence display its overall political, religious and moral bankruptcy of even the civil society . On the other hand, removing this regime is not an easy task as it is backed by US and Europe. In spite of Saudi Arabia’s long history of human rights abuses, its support of Wahhabi terrorism, and its ongoing genocidal war in Yemen, the kingdom has always gotten a free pass (and lots of weapons) from Washington and its allies including France, Germany, Russia and other European countries. Even when a U.S. supplied bomb was used to strike a school bus in Yemen killing 40 children this past August, no one batted an eye. Up to this point the relationship with the Saudis was considered too important to risk. Now for some reason the Khashoggi murder is being treated as a line crossed? This summer, Saudi Arabia promised the Trump administration $100 million and that money landed in American accounts on the same day that Secretary of State Mike Pompeo landed in Riyadh, for discussions with the kingdom’s leaders about the fate of a missing Saudi dissident. Under such circumstance nothing much is going to happen as US., France, Russia and Israel will never allow a regime change as Saudi money is more important than so called values such as democracy, human rights, freedom and the like. It is still worse Muslim world remain in chaos due to US European manipulations.